You have to reach Tirupati or Renigunta to go Tirumala. Many pilgrims prefer to go on foot from the Tirupati to Tirumala to have the Darshan of the Lord. For those who would like to climb the hills to Tirumala to fulfil a vow, there are two well-laid stone footpaths leading to Tirumala. These paths are called sopanamargas. The more ancient of the two sopanamargas which starts from Alipiri at the foot of the hills, is about 11 km in length, and is the commonly used route. This is 4 K.Ms away from the railway station. The other sopanamarga from Sri Vari mettu, though only about 6 km in length. It is mainly used by the local people and traders. Several facilities are provided by the administration to the piligrims who walk the hills to Tirumala . Free transport of the Pilgrims luggage from the bottom of the hill to the Top. Well cemented steps with hand rails for support. Supply of potable water along the way. Toilets for both Ladies and Gents. Well lit path way and security guards to ensure safety of the pilgrims. Small restaurants along the way for refreshments and snacks. The pilgrims have to get to Alipiri toll gate ,where the steps to the Tirumala begins.They can then deposit their luggage at the T.T.D transport office and obtain a receipt.On reaching the top, they can redeem their luggage after producing this receipt. The foot way is 16 Kilometers in distance.It takes roughly between 3 to 4 hours to reach Tirumala by this way. APSRTC (Andhra Pradesh State Road Transport Corporation) runs two free buses from the Tirupati Railway station to Alipiri, with a frequency of 30 minutes. Pilgrims who intend to walk up the hills to Tirumala can use these buses. APSRTC runs a regular bus service between Tirupati and Tirumala, from 0300 hrs to 2400 hrs, with a frequency of just two minutes. You can save time by buying your Tirumala-Tirupati return tickets at Tirupati itself. These tickets are valid for three days from the date of purchase and ticket holders can board any of the APSRTC buses returning to Tirupati within these three days. For the convenience of pilgrims arriving in groups, APSRTC provides contract carriages. Each carriage or bus can be hired for Rs. 900.00. It seats 45 persons. The bus can either be booked then and there, or reserved in advance. 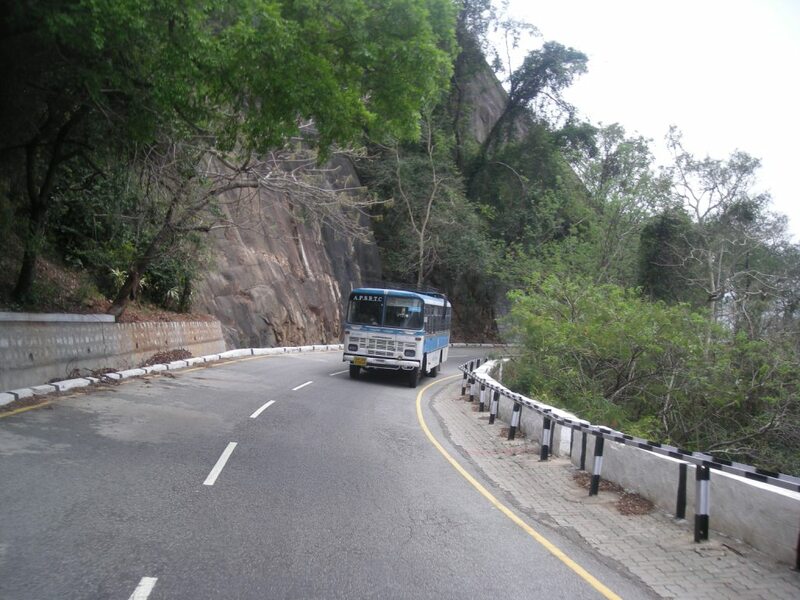 However, if you are using your own vehicle, do negotiate the hair-pin bends on the ghat roads carefully. Tirupati and Renigunta stations are well connected to major Indian cities like Chennai, Mumbai, Hyderabad, Banglore. Renigunta airport is nearest airport to Tirupati.